For a while now, I've really enjoyed the idea of playing an RPG based on early modern humans, toward the end of the Paleolithic Era. 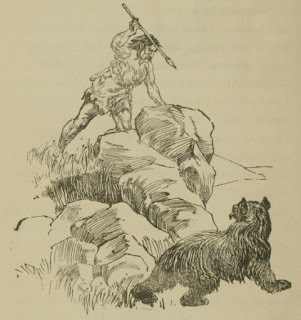 Thanks to all of the stories I've encountered throughout my life involving "cavemen," the prehistoric human is one of the key archetypes in my imagination, right up there with wizards and cowboys and superheroes. There's an interesting period, somewhere around 40-50,000 years ago, where it appears that humans had reached a state of behavioral modernity with regard to abstract thought, use of technology, and maybe even social structures. In other words, modern RPG players could probably be thrown into the situations of this time period and actually have a general idea of how their characters might react. What really takes this time period to another level as an RPG setting, though, is the fact that multiple branches of the near-human family tree probably coexisted. There's an article here that even compares the state of the world at that time to The Lord of the Rings (and that's coming from the statement of a geneticist)! And then, of course, there's Homo floresiensis, the tiny prehistoric humanoid (which may have been around until about 12,000 years ago) nicknamed the Hobbit. It all adds up to an easy re-skin of a basic RPG like Swords & Wizardry White Box to fit the time period. Change up the weapons, of course. Maybe give magic more of a shamanistic flare. Then the non-human character races can be matched to the hominins around at the time. Dwarves are hardy and work well underground...why not make them classic "cavemen" like Neanderthals? Homo floresiensis would be halflings/hobbits, of course. And the branch of humanity known as Denisovans, which hold a lot of mystery with regard to appearance and behavior, can be elves. Heck, there's even evidence of another lineage having interbred with Denisovans at some point, so it would be easy to add in something like orcs and still feel like we're being prehistorically accurate! I might even be okay with a dinosaur showing up in such a campaign. This is an interesting idea. If I were to run something like this, I would borrow heavily from the video game, Far Cry Primal (which I am currently playing and loving).